For my records, I replaced both triggers in my two M&Ps this week. Both triggers needed to be replaced because I took too much off off the trigger safety after installing the APEX competition kit. 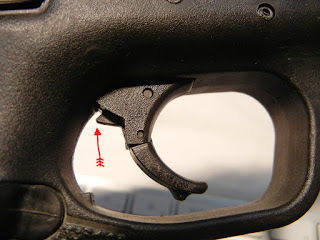 The different trigger spring makes the safety snag on the frame, so in order to fix this you need to take a LITTLE off the tip of the trigger safety. I took too much off of my other two and inadvertently disabled that safety. Fixed it with a new trigger and just a touch off the point. Safety works and the trigger is smooth without any snags. I also cleaned the trigger housing in my main gun. It needed it. I also put a new trigger spring in my main gun. The old one was spreading a bit.